One of the many considerations in putting together a compressed air system is whether or not to include manual bypasses around air treatment. There are different schools of thought concerning this practice, but before you go with including them for the sake of convenience, be sure to understand how it can affect your air quality. In this example, the two “NC” (normally closed) valves can be manually opened and the two valves closest to the refrigerated dryer and filter can be closed in case of maintenance, service, or failure. The air supply would not be interrupted, but it wouldn’t be treated. Therefore moisture, particulates, and other contaminates which are normally addressed with the existing air treatment would be passed along to the distribution system and could adversely affect product quality at the point of use. 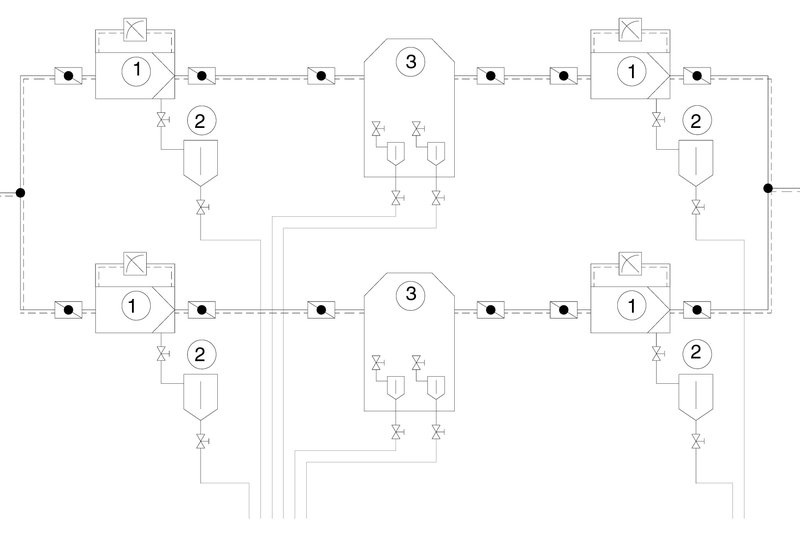 Piping dryers and filters in parallel allows for built-in redundancy, which increases capital costs, but it also ensures a reliable level of air quality. With this approach, the components are sized so if one of the trains were to be offline for any reason, the other could still meet the demand. If sized properly, one section can be closed off without disrupting the air supply or the air quality. Furthermore, leaving both trains online will reduce pressure drop and wear and tear on the components—which could offer savings in the long run. Additionally, when adding multiple dryers in parallel it is highly recommended to consider dryers with energy saving controls. Energy is paramount, and if you go with the parallel approach then the dryers should have some sort of energy management control on them (whether it be desiccant dryers or refrigerated dryers). Energy saving controls will reduce the overall power consumption associated with each dryer, thereby providing a quick payback for this option. In determining which method to use, think about how important air quality is for your application. Can your process tolerate excess moisture for any period of time? Will having contaminants cause product rejects or damage equipment? When put this way, most compressed air users tend to say that they need to maintain a certain quality of air—after all that’s why they have the air treatment components in the system in the first place.